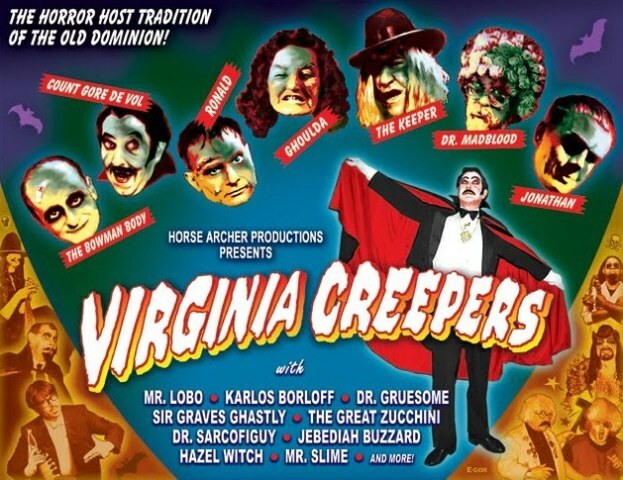 VIRGINIA CREEPERS: The Horror Host Tradition of the Old Dominion! I’ve been a horror host fan for as long as I can remember. Thanks to syndication in the early 80’s, I was able to get my first glimpse of a host via the Son Of Svengoolie from Chicago (playing out of a station in Boston). I soon also became aware of Elvira: Mistress of the Dark but, during this period, this could only be accomplished late at night, weather permitting. On the rare event those rabbit ear antennas did draw the original Movie Macabre the picture was extremely snowy and virtually unwatchable (though I STILL did). With the introduction of cable television, I was finally able to enjoy such hosts as Grampa on TBS’s Super Scary Saturday, Commander USA on the USA Network, and Morgus The Magnificent on WPIX. I loved watching the wide range of monster movies (the good, the bad, and the downright UGLY) as well as the colorful characters that introduced them. Later, in 1991, I came upon a book by Elena M. Watson titled “Television Horror Movie Hosts”. It was then that I realized there were other fans across the nation experiencing the same fervor, but with completely different hosts! Reading SCARY MONSTERS MAGAZINE would further these discoveries, though I longed for the ability to actually see them “live” and performing their shtick. Jump to the present. Thanks to the internet, and people with a similar love of these hosts, I was finally able to see them in action! But with so many different names, it was hard to keep track of who was who…and from where? A documentary chronicling them seemed too good to be true but, once again, I was to become pleasantly surprised. I was not the only adult fan interested in exploring this wonderful art and with this resurgence came new hosts. There are now more hosts than ever and, through the wonders of the Internet, they are now able to share their work with a global audience. This has also led to some amazing documentaries chronicling the classic Horror Hosts, many of which are direct inspirations to the active hosts today. These include AMERICAN SCARY, EVERY OTHER DAY IS HALLOWEEN, Penny Dreadful’s wonderful show on New England hosts, and VIRGINIA CREEPERS: THE HORROR HOST TRADITION OF THE OLD DOMINION. It is this last entry we would like to focus on today. The Daves are pleased to welcome the writing talents of Paulzilla Knight! Paulzilla is not only a big fan of horror hosts, he also is also a lifelong resident of Virginia. 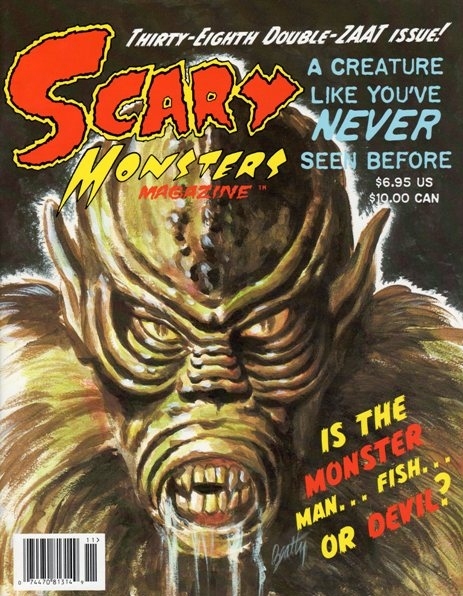 His own MONSTER MEMORIES have been published in the aforementioned SCARY MONSTERS MAGAZINE. This includes an amazing article on one of the hosts featured in VIRGINIA CREEPERS, Dr. Madblood! Paulzilla, after very short notice, has graciously agreed to share his enthusiasm for both VIRGINIA CREEPERS & his favorite host featured on it! Check out SM #38 for more of Paulzilla’s Dr. Madblood memories! Got Horror Hosts?..Please forgive the reference to a certain milk commercial.Whether you live in Virginia,watched these movie monster madmen in your youth or are still watching them today, we have a feeling your going to enjoy VIRGINIA CREEPERS:THE HORROR HOST TRADITION OF THE OLD DOMINION. This “fangtastic” documentary is brought to you by Horse Archer Productions out of Christiansburg,Virginia. It is produced by Sean Kotz and Chris Valluzzo. Sean is also the director of this DVD. 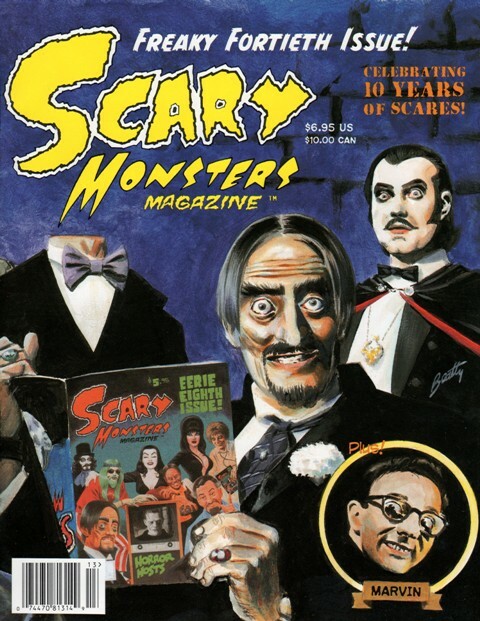 They not only do interviews and show rare clips of these ghoulish guys and gals but also interview folks with fond memories of these shows giving it a fan perspective also. The production crew really did their detective work on this and have been able to contact several folks who have kind of “dropped of the radar” over the years. If you love Horror Hosts, I recommend you add this to your collection! Sean is currently working on the second part of this scary “shockumentary”. In keeping with the theme of this blog the Daves have been brave enough to ask yours ghouly “Paulzilla” to share some of my Horror Host memories…I shall start with the first two I was exposed to growing up in Hampton Roads. Doctor Madblood’s Movie (WAVY-TV 75′ to 82′..83 to 84′ PBS and six New England cable systems..85′ to 88′ several local specials on WAVY again..89′ to 2002 WTVZ-TV..2002 to 2007 WSKY…2008 till the present, yearly Halloween specials on the local PBS) Madblood has been off and on television for 35 years! It was 1977 and a typical hot and humid summer in Norfolk,Virginia. The biggest movie event that year was STAR WARS and it was also when my parents let me stay up late on weekends. I was watching SATURDAY NIGHT LIVE one night when I discovered a magical and monstrous new thing. Right after SNL ended a rock anthem started blaring out of our trusty old Zenith television. Then a view of a spooky Victorian style mansion appeared on the screen, followed by a man in a lab coat wearing a big grey Afro and smoking a pipe. 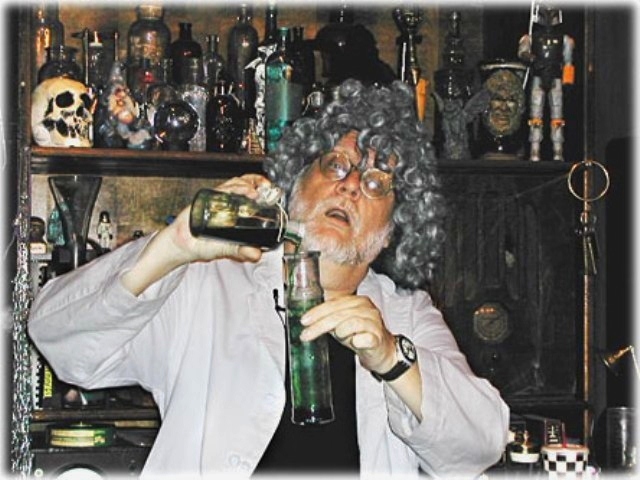 This strange character named Doctor Madblood(Jerry Harrell) said “Hey gang” as those he knew you were there! I was fascinated and wanted to know what all this craziness was all about.I soon became familiar with the cast of characters and addicted to the Madblood madness. Besides the Doc there was the Brain, a wise cracking disembodied lobe with a sarcastic voice in a fish tank (voiced by Craig T Adams), Dusty the Crop-duster (played by local DJ legend Mike Arlo) and as always a beautiful lab assistant, first played by Susie Weston as Velma von Basketcase and later Penny Palen as Nurse Patience Dream. Last but not least the lovable monsters Madblood created, Waldo (Craig Adams), Jinx (Mike Arlo) and Ernie played by Carter Perry who also produced and directed. It’s hard to list all the people associated with the show over the years in the space alloted. I’ve been fortunate enough to attend a few tapings over the years and have had the pleasure of meeting these guys and gals. The Doc usually ended the show with “Thanks for turning us on”. Thank you Doc for the great memories, including the new ones, today! My second introduction to the wacky world of Horror Hosts was Chamber Theatre which aired on WVEC-TV from 84′ to 86′. Rick Clark played “The Keeper of the Chamber”, a grizzled old spooky character with long stringy grey hair,complimented by a black fedora, cape and creepy cane. Rick worked in editing and directing with WVEC years earlier before Production Manager Meyer Davis approached him about creating the character. The Keeper had an over sized rubber fly named “Buzz” who lived under his hat. Kris Curling played the “Chamber Maid” and Janine Harris was the unlucky gal who was hoisted over the Keeper’s shoulder as he ascended the dark stairs. The Keeper had no name and ended the show with “My name”..”you need not know my name”..”I am the Keeper of the Chamber”..”GOODNIGHT”! Unfortunately like a lot of hosts the demise of their movie contract caused the show to be cancelled. I’ve been able to meet Rick at Monsterfest a couple of years ago and what a great guy he is! I have to thank Sean Kotz and Horse Archer Productions for helping me get re-acquainted with old fiends and introduce me to some new ones! For those of you who haven’t purchased this fun DVD, you are in luck! The Daves have teamed up with Sean Kotz to bring you VIRGINIA CREEPERS: THE HORROR HOST TRADITION OF THE OLD DOMINION for a limited time at a reduced price (that’s right…even cheaper than if you bought it on Amazon!). This special offer expires on February 21st so order your copy today! All you have to do is click HERE! This entry was posted in Horror Hosts and tagged Commander USA, Dr Morgus the Magnificent, Paulzilla Knight, SCARY MONSTERS MAGAZINE, SEAN KOTZ, Super Scary Saturday, The Bowman Body, The Late Dr. Lady Show, Virginia Creepers. Bookmark the permalink. ← The Bowman Body Returns!! !